BARNSTORMERS.COM eFLYER - A View from the Cockpit. Contest Winners. This is a photograph of the Chester Airport (kSBC) in Connecticut, USA. Photo provided by Joe Davis. 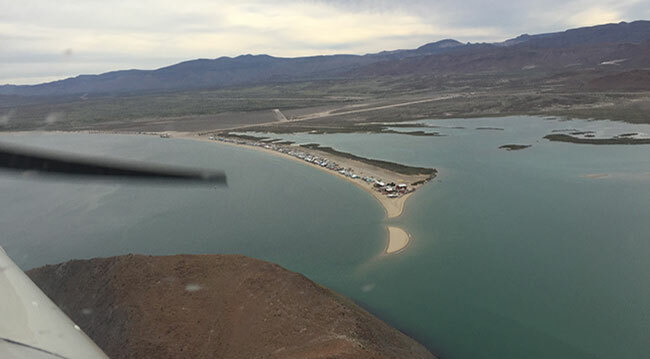 This is a photograph of the Alfonsina Airstrip in Gonzaga, Baja California. Photo provided by Wendy Lessig. No one, we stumped you! This is a photograph of the Niijimma Airport in Japan. Photo provided by Terry Winnett. This is a photograph of the Tallahassee Regional Airport (KTLH) in Florida, USA. Photo provided by Tim Hagen. No one - we stumped you! This is a photograph of the Marshfield Municipal Airport/George Harlow Field (KGHG) in Massachusetts, USA. Photo provided by Robert Flaugher. This is a photograph of the Hamilton Island Airport (YBHM) in Australia. Photo provided by Myles Elsing. This is a photograph of Harbour Grace in Newfoundland, Canada. Photo provided by Gerry Norberg. This is a photograph of the Yeager Airport (KCRW) in Charleston, West Virginia, USA. Photo provided by Will Slicer. This is a photograph of the Fort Worth Spinks Airport (KFWS) in Burleson, Texas, USA. Photo provided by Roy Jageman. This is a photograph of the Idaho City US Forest Service Airport (U98) in Idaho, USA. Photo provided by Gregg Johnson. This is a photograph of the Owen Roberts International Airport (GCM) in George Town, Cayman Islands. Photo provided by Steve Sandefur. This is a photograph of the Half Moon Bay Airport in California, USA. Photo provided by Corey Perlmutter. This is a photograph of the GKOLE Cattaraugus/Olean Municipal Airport in Olean, New York, USA. Photo provided by Bryan Mettler. This is a photograph of the Geraldton (Greenstone Regional) Airport in Ontario, Canada. Photo provided by Russ Mason. This is a photograph of the Telegraph Creek Airport (CBM5) in British Columbia, Canada. Photo provided by Gerry Norberg. This is a photograph of Dug Bar on Snake River in Oregon, USA. Photo provided by Douglas Gilson. This is a photograph of the Bandera State Airport (4W0) in Washington State, USA. Photo provided by Douglas Gilson. This is a photograph of the Easton State Airport (ESW) in Washington State, USA. Photo provided by Douglas Gilson. This is a photograph of the Sugarbush Airport (0B7), in Warren, Vermont, USA. Photo provided by Owen Anderson. This is a photograph of the Warm Springs Creek Airport (0U1) in Idaho, USA. Photo provided by Douglas Gilson. This is a photograph of the Page Municipal Airport in Arizona, USA. Photo provided by Gerry Norberg. This is a photograph of the Walk-Air Airport (38XA) in Tyler, Texas, USA. Photo provided by Roy Jageman. This is a photograph of the Rogers Executive Airport (KROG) located in Benton County, Arkansas, USA. Photo provided by Pete Norwood. This is a photograph of the Buenos Aires Jorge Newbery International Airport in Argentina. Photo provided by Ricardo Wagner. This is a photograph of the Gillies Bay Airport on Texada Island in BC, Canada. Photo provided by Brian Nosko. This is a photograph of the Woolsey Memorial Airport (5D5), near Northport in Michigan, USA. Photo provided by Wallace Weishaar. This is a photograph of the Devil's River Ranch Airport (4TE7) in Del Rio, Texas, USA. Photo provided by Willy Carrol. This is a photograph of the Montgomery Executive Airport (KMYF) in San Diego, California, USA. This is a photograph of the Marine Corps Air Station (MCAS Miramar; NKX) in San Diego, California, USA. This is a photograph of Elizabeth Field (0B8), located on Fishers Island in New York, USA. Photo provided by Kent Wien. This is a photograph of the William P. Hobby airport (HOU) in Houston, Texas, USA. Photo provided by Roy Jageman. This is a photograph of the Oswego County Airport (KFZY) in Fulton, New York, USA. Photo provided by Bryan Mettler. This is a photograph of the Carswell Field (KNFW) at the Naval Air Station Joint Reserve Base in Fort Worth, Texas, USA. Photo provided by Roy Jageman. This is a photograph of the Aspen Pitkin County Airport (KSAE) in Aspen, Colorado, USA. Photo provided by David Mitchell. This is a photograph of the Tangier Island Airport (KTGI) located in the lower Chesapeake Bay, Virginia, USA. Photo provided by Kate Devlin. This is a photograph of the Grand Haven Memorial Airpark, MI. K3GM. Photo provided by Wally Weishaar. This is a photograph of the Marble Canyon Airport (L41) in Marble Canyon, Arizona, USA. Photo provided by Bill Dobson. This is a photograph of an airstrip, belonging to the Church of Scientology, located on the San Miguel Ranch in New Mexico, USA (NM53). Photo provided by Andy Knights. This is a photograph of the Canandaigua (KIUA) in New York, USA. Photo provided by Bryan Mettler. This is a photograph of the Trenton/Robbinsville Airport in New jersey, USA. Photo provided by Robert Flaugher. This is a photograph of a radar testing range in a desert west of Palmdale in California, USA. Photo provided by Brian Moore. This is a photograph of the Hanksville Airport in Utah, USA. Photo provided by Gerry Norberg. This is a photograph of the Benchmark Airstrip (3U7) in Montana, USA. Photo provided by Steve Lowry. This is a photograph of the Wauchula Municipal Airport (KCHN) in Florida, USA. Photo provided by Michael Gillispie. This is a photograph of the International Peace Gardens Airport in Dunseith, North Dakota, USA. Photo provided by Gerry Norberg. This is a photograph of the Sidney Municipal Airport (N23) in New York, USA. Photo provided by Roy Jageman. This is a photograph of the Red Lodge Airport (KRED), in Montana, USA. Photo provided by Herb Karst. No one, we stumped you. This is a photograph of the La Baule-Escoublac (LFRE) airport in Southern Brittany, France. Photo provided by Terry Froggatt. This is a photograph of the Manitowaning/Manitoulin East Municipal Airport in Ontario, Canada. Photo provided by Robert Bowers. This is a photograph of the Meeker Coulter Field Airport (KEEO), in Meeker, Colorado, USA. Photo provided by Denny Benson. This is a photograph of the TEL- AVIV "DOV" airport (LLSD) in Israel. Photo provided by Kevin Sepe. This is a photograph of the La Aurora International Airport in Guatemala City, Guatemala. Photo provided by Dan & Vicki Eifert. This is a photograph of the Sunbury Airport in Pennsylvania, USA (71N). Photo provided by Robert Flaugher. This is a photograph of the Dateland, Arizona Air Force Auxiliary Airfield, near Yuma, Arizona, USA. Photo provided by Gerry Norberg. This is a photograph of the Gila Bend Airport (E63) in Arizona, USA. Photo provided by Gerry Norberg. This is a photograph of the Kuujjuaq Airport in Northern Quebec, Canada. Photo provided by Jack Coghlan. This is a photograph of the Shelter Cove (0Q5), serving Humboldt County in California, USA. Photo provided by Juan Arturo del azar. This is a photograph of the Iqaluit Airport in Nunavut, Canada (CYFB). Photo provided by Jack Coghlan. This is a photograph of the 1L4 Cal-Nev-Ari, also known as Kidwell, in Clark County, Nevada, United States. Photo provided by Don Lewellen. This is a photograph of the National Museum of the Air Force located on Wright Paterson Air Force Base in Dayton, Ohio, USA. Photo provided by Dave Mitchel. This is a photograph of the Marine Corps Air Station Cherry Point in Havelock, North Carolina, USA. Photo provided by Jeff LoParo. This is a photograph of the Halsey Field (North Island Naval Air Station) in San Diego, California, USA. Photo provided by our very own "Baroness." This is a photograph of the Barneo Ice Camp, a Russian-operated drift station on the frozen Arctic Ocean near the North Pole. Photo provided by Rudolf. This is a photograph of the City Airport & Heliport (EGCB) in Manchester, England (previously known as Barton Aerodrome and City Airport Manchester). Photo provided by MediaCityUK. This is a photograph of the Gilliam-McConnell Airfield, just outside Carthage in North Carolina, USA. Photo provided by Jim Pantas. This is a photograph of the Duncan Airport, located adjacent to Duncan in British Columbia, Canada. Photo provided by Rory File. This is a photograph of the Bozeman Yellowstone International Airport (KBZN)​ in Montana, USA. Photo selected by Barnstormers staff. This is a photograph of the Santos Dumont Airport in Rio De Janeiro, Brazil​. Photo selected by Barnstormers staff. This is a photograph of the Vernal Regional Airport in Utah, USA​. Photo provided by Gerry Norberg. This is a photograph of the Vandalia Municipal Airport (KVLA) in Vandalia, Illinois, USA​. Photo provided by Robert Flaugher. This is a photograph of the Fitch Beach Airport (KFPK) in Charlotte, Michigan, USA. Photo provided by Brian Pearson. This is a photograph of the Put-in-Bay on South Bass Island in Ottawa County, Ohio, USA. Photo provided by Greg Burns. This is a photograph of the Sanford Seacoast Regional Airport in Maine, USA. Photo provided by Brinley Peck. This is a photograph of the Narsarsuaq Airport in Greenland. Photo provided by Juan Arturo del azar. This is a photograph of the Male International Airport (IATA: MLE, ICAO: VRMM) in the Maldives. Photo provided by Barry Winston. This is a photograph of the Packer Airport in Radnor, Ohio, USA. Photo provided by John Eveland. This is a photograph of the Qamdo Bamda Airport in Chengguan, Chamdo, China. Photo provided by Jeffrey Meyers. This is a photograph of the Hutchinson-Butler Airport (HCD) in Hutchinson, Minnesota, USA. Photo provided by Stan Gatewood. This is a photograph of the London City Airport in London, England (IATA: LCY; ICAO: EGLC). Photo provided by Mari Hampton. This is a photograph of an airstrip in Idaho, USA, belonging to the Sam Heuchan Family Farm. Photo provided by Buz Heuchan. This is a photograph of the Methow State Airport (S52) in Winthrop, Washington, USA. Photo provided by David Raines. This is a photograph of the Jackson County Airport in Gainesboro, Tennessee, USA. Photo provided by Tom Little & Phil Smith. This is a photograph of the Corfu Kerkiras Airport in Greece. Photo provided by Stephanie Bell . This is a photograph of the Bruce Meadows Airport (U63) in Idaho, USA. Photo provided by James I. Coleman. This is a photograph of the Split Airport (LDSP) in Croatia. Photo provided by Ken Strutz. This is a photograph of the Aero Club Como in Lake Como, Italy. Photo provided by David Thomas. This is a photograph of the Catalina Airport in Avalon, California, USA. Photo provided by Cody Anderson. This is a photograph of the Sky Manor Airport (N40) in Pittstown, New Jersey, USA. Photo provided by Robert Flaugher. This is a photograph of the Mineola–Wisener Field Airport in Texas, USA. Photo provided by Ron Myres. This is a photograph of the Don Mueang International Airport in Bangkok, Thailand. Photo provided by Brian Quimby. This is a photograph of the Djibouti-Ambouli International Airport in Djibouti, Africa. Photo provided by Sarah Bailey. This is a photograph of the Istanbul Atatürk Airport in Turkey. Photo provided by David Proakis. Robert Lange of Brandt Group, Inc. This is a photograph of the Chamberlain Basin Airstrip in Idaho, USA. Photo provided by Jon Bliss. This is a photograph of the Spanish Peaks Airfield (4V1) in Walsenburg, Colorado, USA. Photo provided by Robert Flaugher. This is a photograph of the Baltimore-Washington International Airport (KBWI) in Maryland, USA. Photo provided by Dave Mitchell. This is a photograph of the Searchlight Airport (1L3) in Searchlight, Nevada, USA. Photo provided by Stan Gatewood. This is a photograph of the Okeechobee County Airport (KOBE) in Florida, USA. Photo provided by Dave Wimberly. This is a photograph of the Trenton Robbinsville Airport (N87) in Robbinsville, New Jersey, USA. Photo provided by Robert Flaugher. This is a photograph of the Santa Paula Airport (KSZP) in Southern California, USA. Photo provided by Gareth Williams.